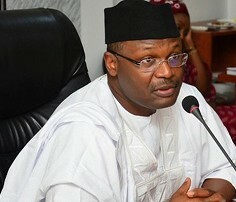 The Chairman of the Independent National Electoral Commission, Prof. Mahmood Yakubu, has said at least 16,000 officials will preside over the September 22, 2019 governorship election in Osun State. Yakubu said this in Abuja at the 2016/2017 Maiden Merit Award Ceremony organised in honour of diligent employees of the commission. The INEC boss said most of the persons INEC would use would be ad hoc workers drawn primarily from the National Youth Service Corps. He said, “While we commend the dedication of our staff, we must never forget the fact that we don’t conduct elections on the strength of INEC staff alone. With a staff strength of a little over 16,000; we don’t even have the strength to conduct the governorship election in Osun in the next 16 days. “We require more than 16,000 persons to conduct the election in Osun State. Therefore, we always make up with what we call the ad hoc staff such as NYSC members, students of tertiary institutions, and sometimes when there is a shortfall and dire need, staff of federal establishments in the various states. Yakubu described staff of the commission as being among the most dedicated public servants in Nigeria. He said INEC had been known to discipline its staff where necessary but said condemnation of staff made no sense outside the context of commendation. The INEC boss therefore stated that it was important to always commend and encourage diligent workers. He added, “The extent to which some of our staff go to ensure that polling units are open at 8am is simply amazing.